I’ve mentioned before that Cakes is a little book lover. She is perfectly content to cycle through her entire library of books over and over again. We’ve always placed value on the importance of reading and books and if given the choice, we’d rather she receive books as gifts rather than toys. Of course it’s the thought that counts, but books can be inexpensive and a great way to expand minds and spend quality time together. While the saying goes that you can’t choose a book by its cover, all books are not created equally. There are books I’ve purchased or checked out from the library that were instant favorites and others that I should have read before buying. I’m sure each book holds a value to someone out there but since a toddler (or mine at least) is most likely going to request reading said book over and over again I want to like the books that we’re reading. Especially because I’ll likely end up memorizing them and so will Cakes. Here’s my list of the Top 5 Best Board Books for Toddlers. 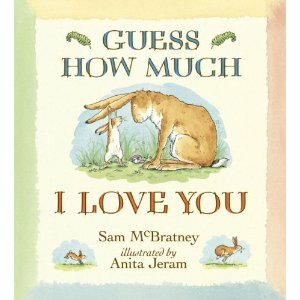 is a book I fondly remember from my own childhood. If you haven’t read the book it’s about a baby bird that wakes up to find his mother missing. Little does he know, she flew off to find him some food. The baby bird sets off in search of his mother and asks many different creatures and objects if they’re his mother before finding himself back in the nest and knowing that his mother is the one that returns with food for him. is a newer book and one that I hadn’t realized existed until last year. It’s the tale of a butterfly from to egg to caterpillar to its final self. The book shows how hungry a growing, changing being can be and the journey it takes to finally comes into its own. is another classic children’s book. This was one of the first books that my daughter started reciting back to me. I love this tale of a bunny going to bed and saying goodnight to everything he could see and think of to delay going to sleep. This definitely reminds me of my Cakes who likes to avoid going to bed at all costs and will do anything to stay up just a little bit longer. is another colorful story by Eric Carle. I love the whimsical nature that Carle injects in each of his stories and this one is all about the sounds at the zoo. The animals and their noises play a pivotal role in this tale but there’s a cute twist at the end. What’s your child’s favorite book? Or what was your favorite book as a child? Those are some great choices! I love love loved Corduroy by Don Freeman! Something about the little bear looking for a home, missing a button… still love that precious story! My kiddos love I Love You Stinky Face. It’s a great bedtime story. Board books are always one of my favorite gifts to give toddlers. It’s nice to be able to let them “read” them on their own and not worry about pages being torn out. You know I’ve never read that one. Maybe I should give that one to Cakes this Christmas. I need to check that one out from the library. Thanks for the suggestion! Cakes is so hard on books – even board books. She probably has a dozen or so that have fallen apart from too much “love”. And paper books are definitely out of the question. I had two copies of a couple of books and gave her one and she thought it was fun to carry just one page around with her. We love all those books and have them 🙂 Great choices! 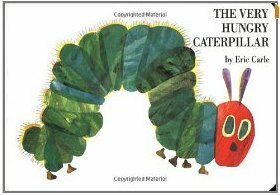 The Very Hungry Caterpillar is one of the hand-me-down books we got from Emma. So not from our childhood but not new. I’ve never even heard of the “Llama Llama books.” And you’re not to get her anything unless you give me ideas for the Dude. 1 and 3 are also on the NookCOLOR…so cute! 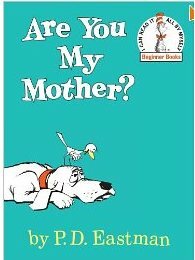 My children loved these books as well, I can still remember how much my now 16yo son loved it when we would read “Are you my mother?” together! 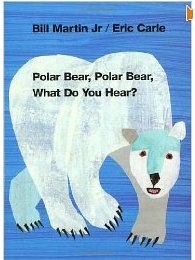 Polar bear, polar bear is just like brown bear, brown bear but it’s animal noises versus the animals the bear is seeing. A lot of Eric Carle books have a similar rhythm to them I’ve found. I need to get some of these for Sweet T. Right now she only wants to read Baby Einstein Touch and Feel, but her tastes change with the wind. 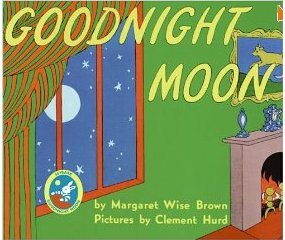 YOu know, I’ve never gotten into Goodnight Moon but I know I’m like the only one. LOVE all the others!